Leading bridal gown designer rolls out revamped Internet blog sites. You will love the royal treatment provided by Christina Wu. Christina Wu announced that its new blogs are now live. The leading bridal designer rolled out its revamped Internet blog sites on Friday, February 1. 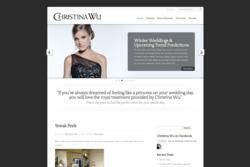 Regular updates and new material will be added to http://www.christinawu.net/blog for brides, retailers, and fashionistas. Christina Wu’s redesigned blog site will serve as an observational and informational resource, with access to company press releases, trend predictions, industry news, top-selling styles, questions and answers, and how-to articles. Images of Christina Wu wedding dresses, local authorized retailer news, community and relief efforts, and behind-the-scenes sneak peeks into photo shoots and more are now available for bloggers. The company’s rollout of its new blog ties into ongoing efforts to reach its consumers directly through social media platforms. To browse breathtaking Christina Wu bridal gowns, visit http://www.christinawu.net. For the bridal party, go to http://prettybridesmaids.com.